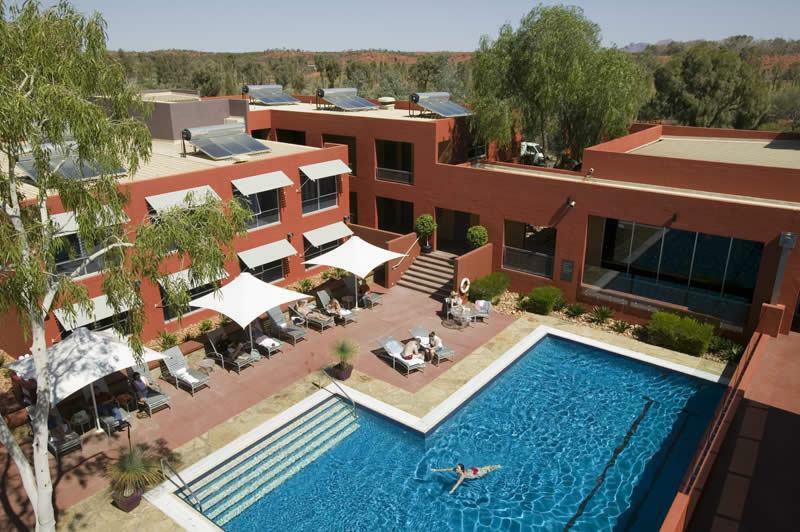 Voyages The Lost Camel Hotel is located right in the heart of Voyages Ayers Rock Resort, a convenient 20 minute drive from the world famous Uluru. 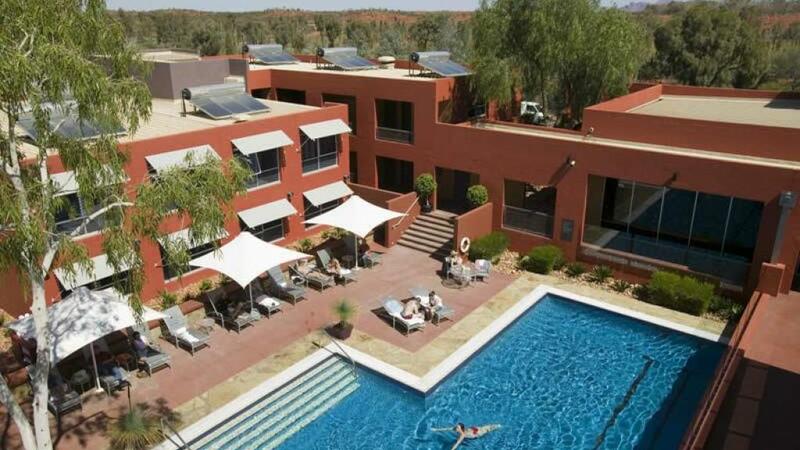 Voyages Ayers Rock Resort consists of 4 hotels and a campground, and the hub of the whole resort is the Town Square, where you will find a fantastic range of services and shops. 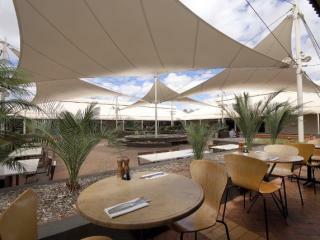 It is also a great place to enjoy your lunch, a cool drink or coffee! 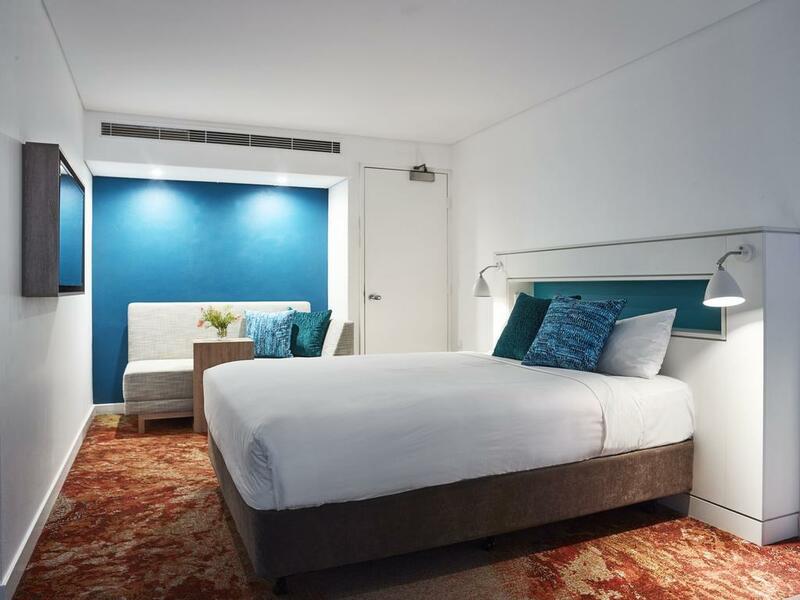 Voyages The Lost Camel Hotel offers guests newly renovated Standard Rooms that are furnished in a stylish mix of Aboriginal and urban themes. 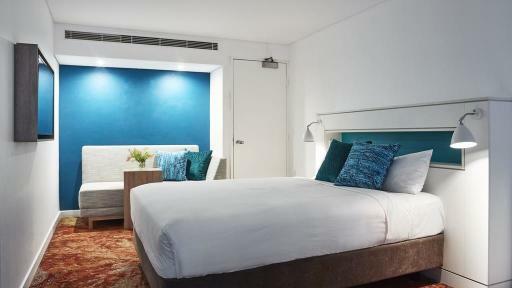 Each room also features air conditioning, tea and coffee making facilities, mini-bar and WiFi access. 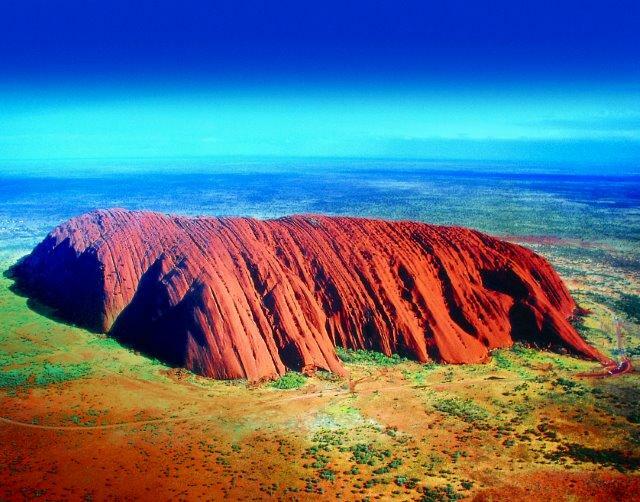 With many tours, local activities and attractions within the Resort and the Uluru (Ayers Rock) - Kata Tjuta (The Olgas) National Park, your days will be action-packed. 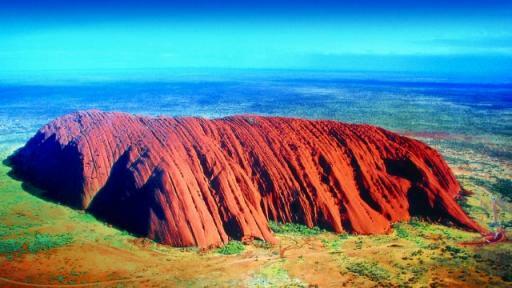 Ride a camel across the desert dunes or embark on a base walk of Uluru (Ayers Rock). The Standard Rooms at Voyages The Lost Camel Hotel are decorated in bright colours and crisp, clean whites. Each room features a bathroom with a separate shower, toilet and open-plan vanity. 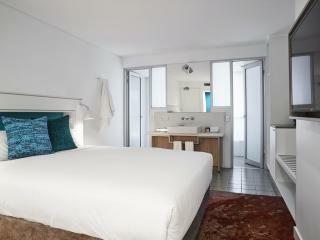 Standard Room: These studio styled rooms are furnished with a stylish mix of Aboriginal and urban themes. Please note there are are no windows in the bedroom, however the large windows in the bathroom emit abundant sunshine for both rooms. Bedding is 1 King Bed OR 2 Single Beds. 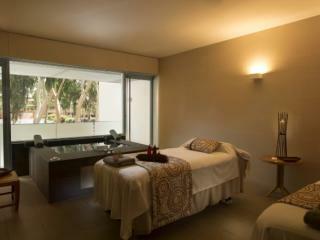 Maximum room capacity is 3 Adults & Children. 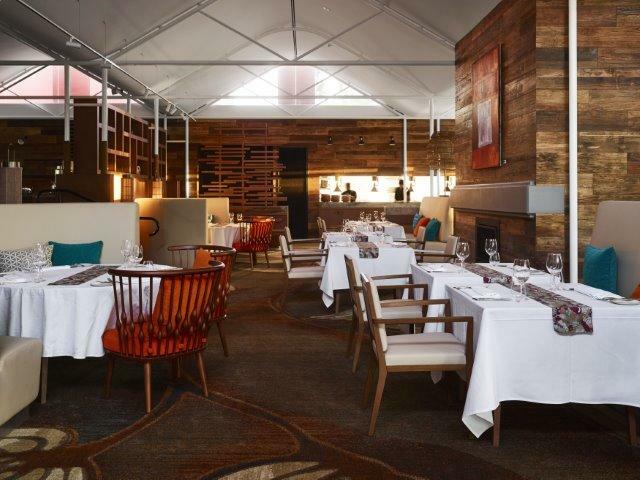 Arnguli Grill: Serving a table d hote menu of two and three set menu options in modern, formal surrounds. Featuring gourmet bushtucker cuisine. Children's menu available. 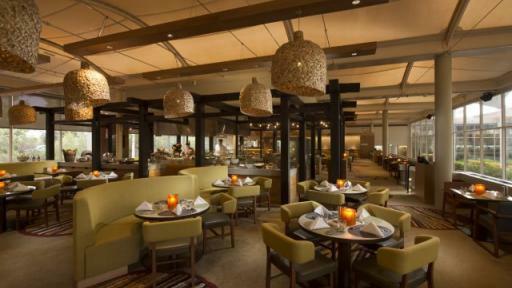 Open daily for dinner and reservations are essential. Located at Desert Gardens Hotel. 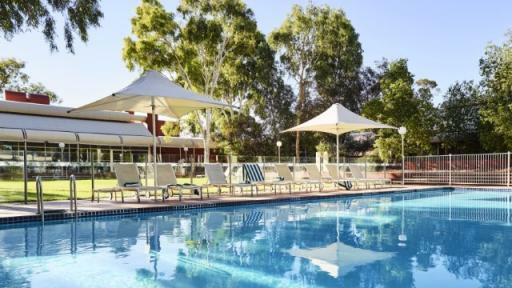 Mangata Bistro & Bar: Found at the Desert Gardens Hotel, the lunch and dinner menu showcases fine Australia produce enhanced by flavours from native Australian bush tucker. A breakfast buffet is also available. 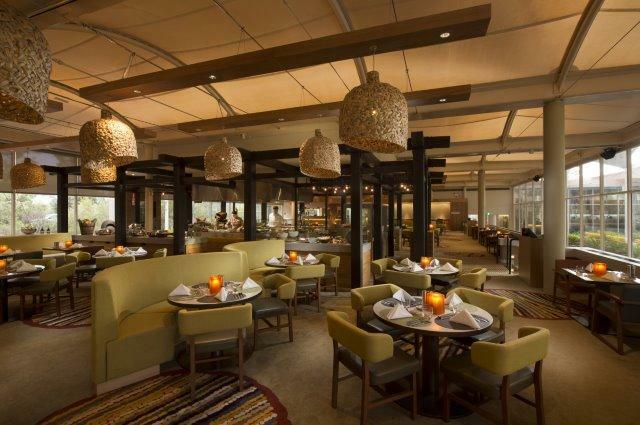 Ilkari Restaurant: Situated at Sails in the Desert Hotel, this restaurant offers an international menu along with an egg and pancake station. Also offering a range of salads, vegetables, antipasto delights, pastas and roasts. Children's menu available. Open daily for buffet breakfast and dinner. Reservations essential. 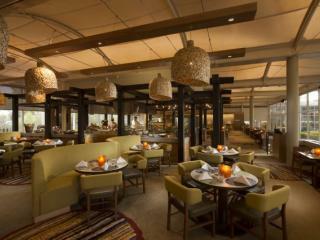 Walpa Lobby Bar: A casual bar offering either coffee and cake as well as lunch and dinner. Children's menu available. Open from sunrise to late (seasonal). All day dining menu is available from 11.00am until 10.00pm. 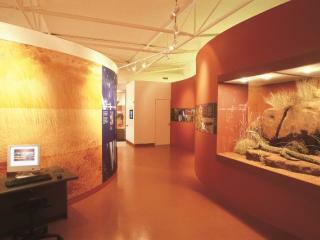 Located at Sails in the Desert. 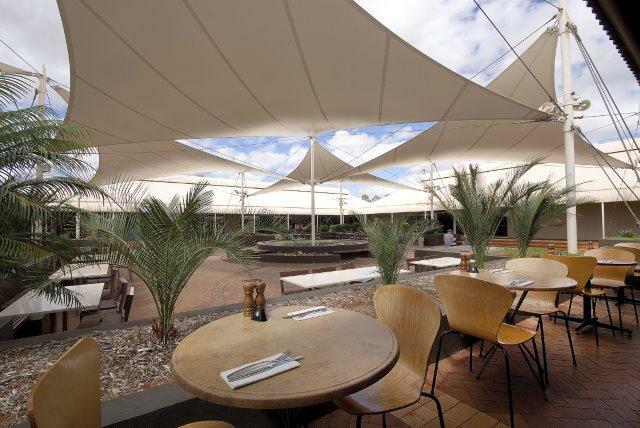 Pira Pool Bar: Located at Sails in the Desert, this poolside bar offers a setting for casual dining, serving a selection of Mediterranean, classic Australian steaks and fish and chips. Children's menu available. Open for light meals and drinks from 10.00am until 7.00pm, and seasonally for dinner. Ayers Wok Noodle Bar: Perfect for a quick dining option offering classic Asian cuisine. Located in the Town Square. Open seasonally for Lunch 11.30am until 3.00pm and again for Dinner 6.00pm until 9.00pm daily, take-away only. Pioneer BBQ and Bar: Located at Voyages Outback Pioneer Hotel & Lodge for DIY BBQ (meat must be purchased at the BBQ Bar) with traditional Aussie charm. Open daily for dinner and live entertainment nightly. Bough House Restaurant: Located at Outback Pioneer Hotel & Lodge. 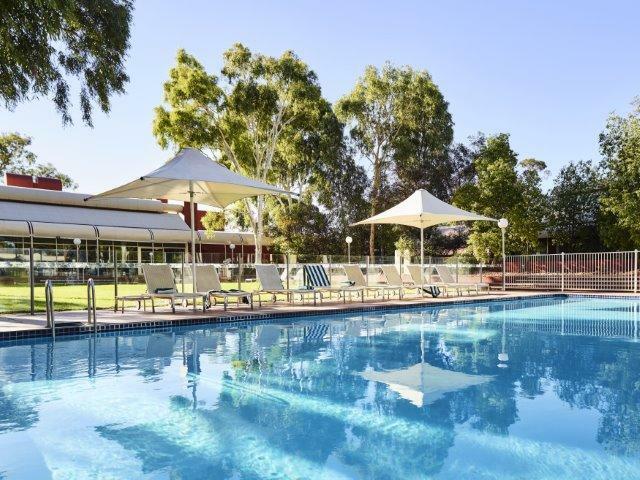 Offers traditional Australian breakfasts and outback Australian dinners serving buffets featuring traditional Aussie 'tucker' and local delicacies including meats, special breads, pastries and desserts. Children's menu available. Open daily for breakfast & seasonally for dinner. Outback Pioneer Kitchen: Affordable pizzas, burgers, salads, wraps and sandwiches. Open daily for lunch and dinner. Gecko's Café: Serving gourmet pizzas, pasta and Mediterranean style dishes, coffee and cocktails. Relax and snack outdoors on the terrace or take-away is an option. Open for lunch and dinner. Children's menu available. Located in the Resort Town Square. Kulata Academy Cafe: Offers sandwiches, salads and light breakfast options along with cakes, pastries and coffee. Open daily for lunch and afternoon. The cafe is staffed by local indigenous trainees. Located in the Resort Town Square. 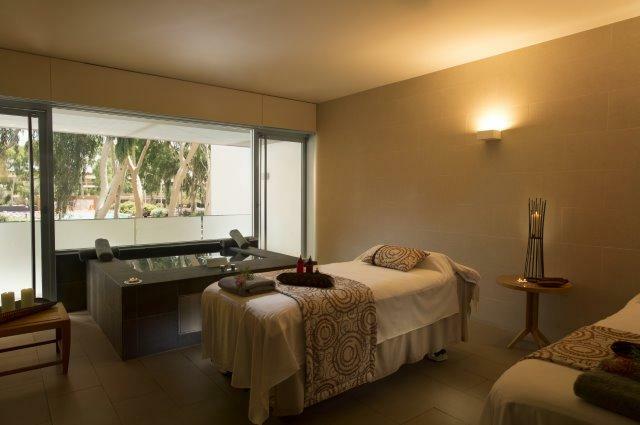 Red Ochre Spa: Rejuvenate your mind, body and soul with a treatment from the extensive menu. 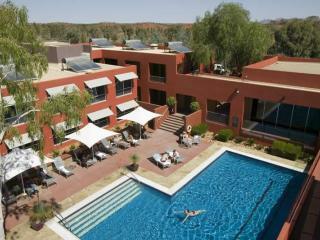 Located within Sails in the Desert Hotel. 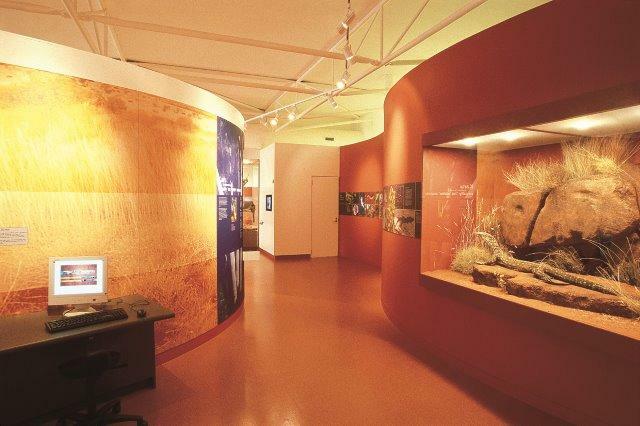 Open daily from 8.30am - 7.00pm. Reception: Open from 6am until 10pm. Check in prior to 6am can be done at Sails in the Desert Hotel reception.